Antonis Samaras (Greek: Αντώνης Σαμαράς, pronounced [anˈdonis samaˈras]; born 23 May 1951) is a Greek politician who was Prime Minister of Greece from 2012 to 2015 and leader of New Democracy from 2009 to 2015. Samaras previously served as Minister of Finance in 1989, as Minister of Foreign Affairs from 1989 to 1992, and as Minister of Culture and Sport in 2009. Samaras was previously best known for a 1993 controversy in which he effectively caused the New Democracy government, of which he was a member, to fall from power. In spite of this he rejoined the party in 2004 and was elected to its leadership in a closely fought intra-party election in late 2009. He was the seventh leader of the party since it was founded in 1974. Born in Athens, Samaras is the son of Dr. Konstantinos Samaras, who was a Professor of Cardiology, and Lena, née Zannas, a maternal granddaughter of author Penelope Delta. His brother, Alexander, is an architect. His paternal uncle, George Samaras, was a long-standing member of Parliament for Messenia in the 1950s and 1960s. Samaras grew up among the Athens well-connected families, playing tennis. At the age of 17, he won the Greek Teen Tennis Championship. He attended school in the Athens College (founded by his maternal great-grandfather, Stefanos Delta, and Emmanouil Benakis, Delta's father-in-law), and graduated from Amherst College in 1974 with a degree in economics, and then from Harvard University in 1976 with an MBA. Samaras and former Prime Minister George Papandreou were dormitory roommates during their student years at Amherst College, but became bitter political rivals. Samaras is married and has a daughter and a son. Samaras has been elected as a Member of the Hellenic Parliament, initially for Messenia, from 1977 onward. In 1989 he became the Finance Minister, later advancing to become the Minister for Foreign Affairs in the New Democracy government of PM Konstantinos Mitsotakis (1990–93), from which post he caused the "Macedonian Question" to ignite. It remains an awkward diplomatic situation, involving both a national name and a heritage dispute. After being removed from his post in 1992 over this issue, Samaras founded his own party, "Political Spring" (Greek: Πολιτική Άνοιξη, Politiki Anoixi), located politically to the right of New Democracy. The defection of one Member of Parliament from New Democracy to Samaras' party caused the government's fall from power in 1993. Political Spring gained 4.9 per cent of the vote in the 1993 general election, earning ten seats in the Greek Parliament. They gained 8.7 per cent in the elections in the 1994 European Parliament elections, earning two seats. Its decline started in the 1996 general election, when it gained 2.94 per cent, just below the 3 per cent threshold necessary to enter parliament. They participated in the 1999 European Parliament elections, but only got 2.3%, which was not enough to elect MEPs. Political Spring did not participate in the 2000 general election, and Samaras publicly supported the New Democracy party. Before the 2004 general election, Samaras dissolved his party, rejoined New Democracy and he was elected a MEP in the 2004 European elections. In the 2007 Greek legislative election he was elected to the Greek Parliament for Messenia, and consequently resigned from the European Parliament. In January 2009 he was appointed Minister for Culture following a government reshuffle. In this capacity he inaugurated the new Acropolis Museum in July 2009. He was reelected in Messenia in 2009. 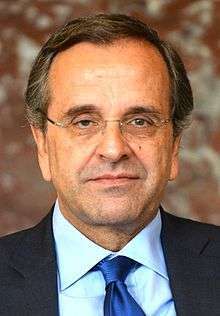 After New Democracy resoundingly lost the 2009 legislative election, Kostas Karamanlis resigned as head of the party, prompting a leadership race, and Samaras ran for the post. Early polls showed he was running neck and neck with the perceived initial favorite Dora Bakoyanni, the former Foreign Minister and former Athens mayor. Shortly thereafter, another leadership candidate, former Minister Dimitris Avramopoulos announced he was resigning his candidacy and would support Samaras instead. In a break with previous practice, an extraordinary party congress resolved that the new leader would be elected by party members in a countrywide ballot. Samaras' candidacy soared in opinion polls and finished the race as a favorite. In the early morning hours of 30 November 2009, Samaras was elected the new leader of the New Democracy party. Following early results showing Samaras in a comfortable lead, Bakoyanni, his main rival, conceded defeat and called Samaras to congratulate him. He accepted his election with a speech at the party headquarters, and pledged to carry out a broad ideological and organizational reform, aspiring to regain majority status. He was later instrumental in the expulsion of Ms. Bakoyanni (May, 2010) for defying the party line and voting for an austerity measure required for European Union-International Monetary Fund backed lending. Prime Minister George Papandreou announced his government's plans on 31 October to hold a referendum on the acceptance of the terms of a eurozone bailout deal. The referendum was to be held in December 2011 or January 2012. Following vehement opposition from both within and outside the country, Papandreou however scrapped the plan a few days later on 3 November. On 5 November, his government only narrowly won a confidence vote in parliament and Samaras called for immediate elections. The next day Papandreou met with opposition leaders trying to reach an agreement on the formation of an interim national unity government. However, Samaras only gave in, after Papandreou agreed to step aside, allowing the EU bailout to proceed and paving the way for elections on 19 February 2012. After several days of intense negotiations, the two major parties along with the Popular Orthodox Rally agreed to form a grand coalition headed by former Vice President of the European Central Bank Lucas Papademos. On 10 November, George Papandreou formally resigned as Prime Minister of Greece. The new coalition cabinet and Prime Minister Lucas Papademos were formally sworn in on 11 November 2011. Following the May 2012 legislative election where the New Democracy party became the largest party in the Hellenic Parliament, Samaras was asked by Greek President Karolos Papoulias to try to form a government. However, after a day of hard negotiations with the other parties in Parliament, Samaras officially announced he was giving up the mandate to form a government. The task passed to Alexis Tsipras, leader of the SYRIZA (the second largest party) who was also unable to form a government. After PASOK also failed to negotiate a successful agreement to form a government, emergency talks with the President ended with a new election being called while the outgoing chairman of the Council of State Panagiotis Pikrammenos was appointed as Prime Minister in a caretaker government composed of independent technocrats. Voters once again took to the polls in the widely watched June 2012 election. New Democracy came out on top in a stronger position with 129 seats, compared to 108 in the May election. On 20 June 2012, Samaras successfully formed a coalition with PASOK (now led by former Finance Minister Evangelos Venizelos) and DIMAR. The new government had a majority of 28 (which was later reduced to 18), with SYRIZA, Independent Greeks (ANEL), Golden Dawn (XA) and the Communist Party (KKE) comprising the opposition. PASOK and DIMAR chose to take a limited role in Samaras' Cabinet, being represented by party officials and independent technocrats instead of MPs. DIMAR left the coalition on 21 June 2013 in protest at the closure of the nation's public broadcaster ERT, leaving Samaras with a slim majority of 153 ND and PASOK MPs combined. The two remaining parties proceeded to negotiate a cabinet reshuffle that resulted in a significantly expanded role for PASOK in the new coalition government. A further reshuffle followed the 2014 European Parliament election. Samaras implemented a series of reforms and austerity measures with the aim of reducing government budget deficits and making the Greek economy competitive. In 2013 he passed reform bills approving the layoff of 15,000 public employees, among them high school teachers, school guards and municipal policemen. At the same time, he cut value-added tax (VAT) in restaurants to 13 percent from 23 percent. He also passed a bill instituting the Single Property Tax and the auction of houses. The Minister of Administrative Reform and e-Governance Kyriakos Mitsotakis implemented an evaluation process on the public sector to locate surplus staff members. Greece achieved a primary government budget surplus in 2013. In April 2014, Greece returned to the global bond market as it successfully sold €3 billion worth of five-year government bonds at a yield of 4.95%. Greece's credit rating was upgraded by Fitch from B− to B. Greece returned to growth after six years of economic decline in the second quarter of 2014, and was the eurozone's fastest-growing economy in the third quarter. Tourism also grew. It is estimated that throughout 2013 Greece welcomed over 17.93 million tourists, an increase of 10% compared to 2012. More than 22 million tourists visited Greece in 2014. On Healthcare, Minister for Health Adonis Georgiadis gave complete free pharmaceutical coverage to more than 2.000.000 uninsured citizens, with the cost being set at 340 million euros. On 9 December 2014, Samaras announced the candidacy of New Democracy politician Stavros Dimas for the position of President of Greece. Stavros Dimas failed to secure the required majority of MPs of the Hellenic Parliament in the first three rounds of voting. According to the provisions of the Greek Constitution, snap elections were held on 25 January 2015, which were won by SYRIZA. He resigned as chairman of New Democracy on 5 July 2015, following the overwhelming victory of the "No" vote in the Greek bailout referendum, naming Vangelis Meimarakis as transitional chairman. Samaras had been backing a "Yes" vote, together with his party, before the referendum. ↑ "ND heads for tense election showdown". Kathimerini. 30 November 2009. Archived from the original on 2 December 2009. Retrieved 30 November 2009. ↑ "Macedonian Issue". Mike Kamateros. 7 November 2009. ↑ "Bakoyannis Holds Slim Lead in Greece's ND Race". Angus Reid. 1 November 2009. Archived from the original on 17 June 2011. Retrieved 6 November 2009. ↑ "Antonis Samaras is the new ND leader". Mike Kamateros. ↑ "Samaras tries to form Greek coalition". Rthk.hk. Retrieved 14 May 2012. ↑ Petrakis, Maria. "Greek Government Mandate to Pass to Syriza as Samaras Fails". Bloomberg. Retrieved 14 May 2012. ↑ "Antonis Samaras". BBC News. 20 June 2012. Retrieved 20 June 2012. ↑ "Greek deputy quits ruling coalition party". Reuters. 8 November 2012. ↑ "PM Antonis Samaras announces cabinet". BBC News. 2012-06-21. Retrieved 2012-06-22. ↑ "Greece coalition partner pulls out ministers in wake of ERT debacle [update]". Kathimerini. Piraeus. 24 June 2013. Retrieved 24 June 2013. ↑ Η σύνθεση της νέας κυβέρνησης (in Greek). Athens: ΓΕΝΙΚΗ ΓΡΑΜΜΑΤΕΙΑ ΕΝΗΜΕΡΩΣΗΣ & ΕΠΙΚΟΙΝΩΝΙΑΣ - ΓΕΝΙΚΗ ΓΡΑΜΜΑΤΕΙΑ ΜΕΣΩΝ ΕΝΗΜΕΡΩΣΗΣ. 24 June 2013. Retrieved 24 June 2013. ↑ "New government is ushered in". Kathimerini. Piraeus. 24 June 2013. Retrieved 24 June 2013. ↑ Σαρωτικός ανασχηματισμός: Η σύνθεση της νέας κυβέρνησης - τα βιογραφικά. Kathimerini (in Greek). 9 June 2014. Retrieved 9 June 2014. ↑ "Greece approves scheme to fire thousands of public workers". reuters.com. 17 July 2013. Retrieved 25 July 2015. ↑ "Auctions: The bill has passed". Proto Thema. Retrieved 4 January 2014. ↑ "Evaluation and dismissal process expanded to wider public sector". tovima. Retrieved 5 November 2013. ↑ "Greek €3bn bond sale snapped up". www.ft.com. 10 April 2014. Retrieved 10 April 2014. ↑ "Fitch Upgrades Greece to 'B'; Outlook Stable". Reuters. Retrieved 23 May 2014. ↑ "Greece exited recession in second quarter, says EU Commission". Kathimerini. 4 November 2014. Retrieved 4 November 2014. ↑ "GDP up by 0.3% in the euro area and by 0.4% in the EU28" (PDF). Luxembourg: Eurostat. 6 March 2015. Retrieved 9 March 2015. ↑ "Tourists arrivals up to 23 million in 2014". thetoc. 10 November 2014. Retrieved 10 November 2014. ↑ Παραιτήθηκε ο Αντώνης Σαμαράς από την ηγεσία της Νέας Δημοκρατίας (in Greek). in.gr. 5 July 2015. Retrieved 5 July 2015. Wikimedia Commons has media related to Antonis Samaras.